On top of that, the way people consume sports media has evolved. Rather than spending hours watching an entire round of golf or a baseball game on TV, viewers would rather catch the highlights through a digital platform, such as an app, an OTT service, or social media. Fans want a brief glimpse into the score and status of the event while using video highlights to gain context. 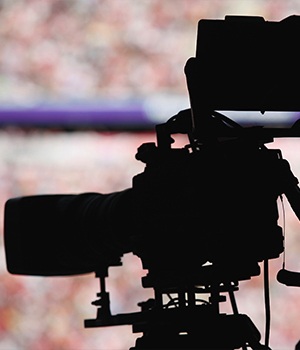 This change in viewing habits places new importance on highlights production and real-time data. Compounding the problem is that sports broadcasters and rights holders often run duplicate workflows in parallel. For example, a sports-governing body's communications, digital, and video services teams all might be after the same piece of content to use for different purposes. Communications wants to capture and upload a clip to its FTP site for an end user, while the digital team grabs the same content and posts it to social media, and video services saves it to a file-hosting portal for delivering to the host broadcaster. When a single video gets replicated in several places, and no one is communicating or using the same workflow, obvious inefficiencies result. All those factors lead to one conclusion: Host broadcasters need a way to consolidate workflows and centralize access to content, so all stakeholders can find and use it whenever they need to for whatever purpose. The solution captures every moment - even ones that don't make it into the linear broadcast - so video services teams can create highlights and distribute them quickly, while at the same time archiving them for ease of use later. One option is a live event service that combines a real-time access and distribution cloud platform and a services team well versed in archiving, workflow customization, and highlights production during live events. Such a service would make it much easier for rights holders to capture, amplify, and monetize the most compelling moments in sports and live events. The idea behind a live event service boils down to the simple concepts of centralization and "capture once, access for many." By capturing the content once; storing it in a central, easily accessible location; and making it available to any stakeholder who needs it, media organizations eliminate inefficiencies and make better use of their content - during and after the event. Key to a live event service is archiving. As the event is being filmed, every moment from every source is ingested into a cloud-based digital asset management (DAM). From there the content is tagged and saved in the cloud-native DAM, where it will be searchable and shareable for future generations to discover. Behind the scenes, live event technology within a DAM ecosystem, integrates into the host broadcaster's on-site network as far upstream as possible to gain access to all camera streams. Integrating the technology at the source means the content can be captured one time and used for many purposes by many people. Once the content has been ingested and archived in the cloud, it is available immediately for dynamic viewing, production, and distribution using cloud-based acceleration. The idea is to give permissioned access to the people who need it - such as internal stakeholders, broadcast partners, and sponsors - with the aim of getting content out of the compound as quickly as possible during the event (and making it easier to use later). Cloud access and distribution happens through a centralized, web-based portal tied to the cloud-native archive - serving as a central access point through which users can acquire, enhance, and distribute media gleaned from the live event. The portal allows any authorized users to interact with the content in real time as if they were sitting in the broadcast compound, even though they might be thousands of miles away. A true live event service provides an on-site team that handles all content capture, upload, management, metadata, and user support during the event. Considering the significance of highlights in today's world of bite-sized digital viewing, highlights production is an important part of what the on-site team does. The team curates the video as it is coming in and works closely with on-site producers to make insightful and informed editorial and production decisions about how to use it. Once complete, the highlights are delivered to the client for syndication through the client's website, app, or other branded platform or digital channels. Real-time scoring data is a critical component of highlights production. At sports events, especially golf or tennis tournaments, there are so many shots or plays occurring simultaneously that it's extremely difficult to stay on top of everything in real time. A live event service powered by a DAM platform, uses a standardized metadata schema that integrates with scoring-data providers to allow robust, timeline-searchable metadata on site and in the archive. That means both the on-site team and remote operators can rely on instant scoring data to zero in on the moments that resonate with viewers, and a single producer can track, manage, and make better decisions more quickly in a fast-paced live-production environment. A live event service taps into a broadcast network, gathers content in real time, and accelerates that content into the cloud, where it becomes accessible through the web by anyone with permission. From there, content is transcoded into multiple formats that various end users can accept. Meanwhile, on-site teams create highlights that meet fans where they are ¦ on digital platforms. In using such a service, broadcasters and sports rights holders can expand the reach and lifecycle of their content, get it to the right people at the right time more quickly and efficiently, and ultimately open more opportunities for monetization and fan engagement.